KIEV, Ukraine -- Three and a half years ago, Volodymyr Zelenskiy's television series Servant of the People began airing on Ukrainian television. Mr Zelenskiy is one step away from the presidency. For a country where money and powerful oligarchs have long dominated politics, the concept was beguiling. Now after victory in the first round, Mr Zelenskiy is one step away from the real deal. Or could we be witnessing a sophisticated, very 21st-Century election heist? Unconventional campaign Mr Zelenksiy's entire election campaign has been based on being different and defying convention. So there have been no official rallies or political speeches, and lots of cheerful videos on social media. The 41-year-old has made his ignorance a virtue and openly admits to having no strong political views. "No promises, no disappointment" is one of the few memorable things he's said. As he showed me around the corridors of his highly successful production company Kvartal 95, Mr Zelenskiy joked with me about how he liked Monty Python, before lamenting that the audience for his TV shows are more into the slapstick "Benny Hill"-type humour. We watched as his colleagues toasted his 41st birthday over glasses of champagne. Some were genuinely in tears as they expressed their support for his presidential campaign, but sadness that he might be about to leave them. When we moved into the staff canteen for a more serious interview, it was immediately clear that Mr Zelenskiy's political views were still very much a work in progress. There were vague commitments to "stop the shooting" in eastern Ukraine, but a jumble of ideas of how to do it. Ukrainian emigration was another big issue, he told me, but there were no immediate ideas on how to stop the brain drain. Things didn't get any better when I turned to Mr Zelenskiy's Achilles heel: his business ties to Ukraine's most controversial oligarch, Ihor Kolomoisky. The links are there for all to see. All the comedian's TV shows are on one of Ukraine's most popular TV channels 1+1. When I spoke to Mr Kolomoisky in Israel, he did little to play down his role in the actor's rise, gushing that he wished there were "millions of Zelenskiys". And there's no doubt that 1+1 has given its full backing to the comedian. Four days before the vote, the latest series of Servant of the People premiered, and on the night before the election a full evening was dedicated to Mr Zelenskiy's back catalogue. The question then is what, if anything, a President Zelenskiy would give back in return. When we spoke, the comedian insisted he was "no puppet" of Mr Kolomoisky and said that if courts found against the oligarch, he would receive no protection. 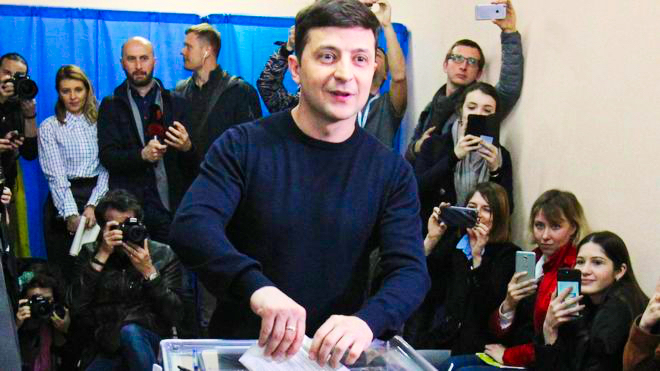 For now, Mr Zelenskiy must focus on the second round in three weeks' time. His likely opponent Petro Poroshenko has a more established network on the ground and the support of administrators across the country.